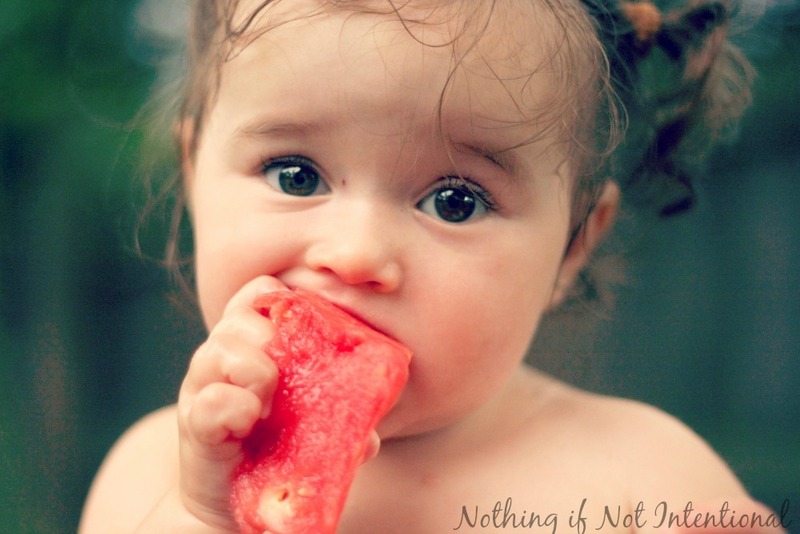 You’ve had a peek into our baby’s menu, but what about older, harder-to-please babies/toddlers? What does a one-year-old eat? Our oldest daughter (now 3 1/2) has always loved strange (frozen, uncooked lima beans) and exotic (pomegranate and papaya) foods and flavors. I can’t explain why, but I’m certainly hoping we can replicate our success with our younger daughter! To help me remember what we fed/feed our children, I keep lists of our menu ideas. I sometimes refer to them when we get in a food rut. 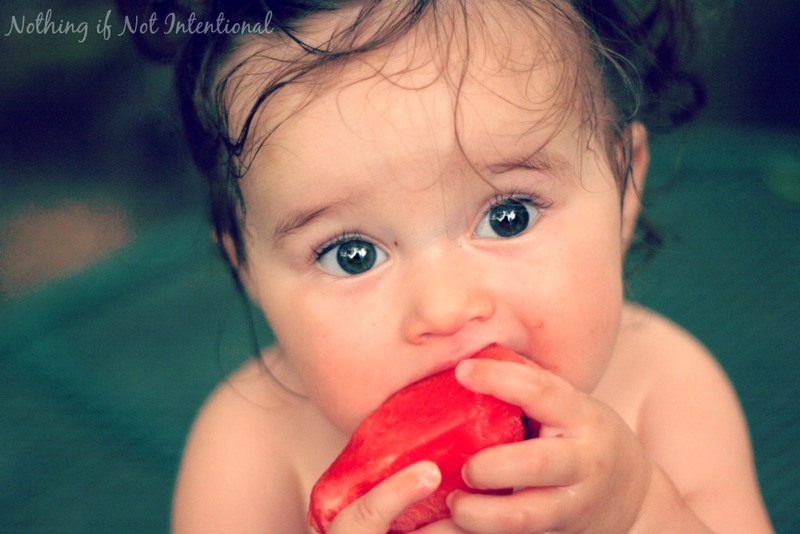 And since I love hearing food ideas from other moms, I thought I’d share my list(s) with you! For nutrition advice and food-safety tips, I again defer to the experts. 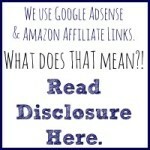 Check out this website for more info. 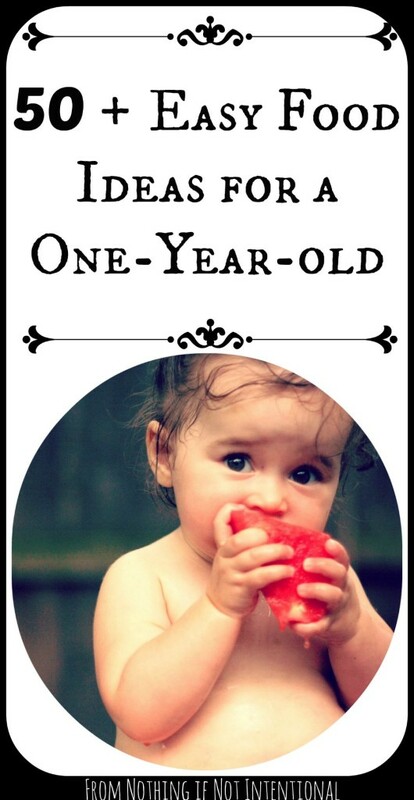 Food for a One Year Old–50+ Easy Ideas! Pears–This no-sugar added recipe for pearsauce is always a hit at our house. Smoothies–check out this recipe for the “perfect” smoothie! Puffed millet, puffed rice, etc. Bumbleebee stew–a yummy vegetarian dish packed with veggies and a special ingredient that kids love. Next up: food ideas for two-year-olds! on pinterest to be sure you don't miss future updates! 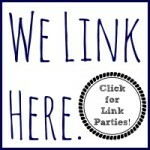 Follow Rachael at Nothing if Not Intentional's board Food for Kids on Pinterest.